Buy Jason Super Shine Apricot Shampoo 473ml in the UK from our online shop or directly from our independent Scottish store. This Super Shine Shampoo gently and effectively removes dirt and unwanted build-up restoring your hair’s natural glow and bounce. Shine enhancing Apricot Oil smoothes hair cuticles for a perfectly reflective brilliance, while Soy Protein and Aloe Vera replenish moisture from the root to tip. Sleek and luminous, your hair shines brighter with touchable softness. Where can you buy real Apricot Shampoo safely online? If you are wondering where you can buy Jason Super Shine Apricot Shampoo 473ml safely online in the UK, then shop with us. 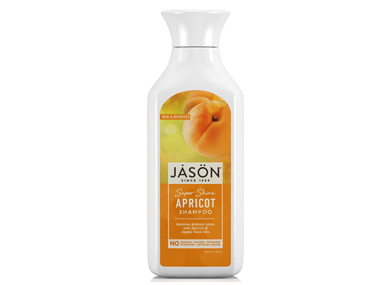 Apricot Shampoo - Jason Super Shine Apricot Shampoo 473ml in Shampoos and Hair Care.